Photo: T. R. Kelly House, ca. 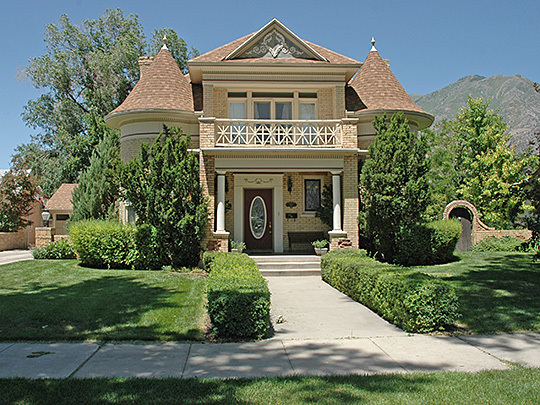 1903, 164 W. 200 South, Provo, UT. Listed on the National Register of Historic Places in 1983. Photographed by User:Ntsimp (own work), 2012, [cc0-by-1.0 (creativecommons.org/publicdomain/zero/1.0/deed.en], via Wikimedia Commons, accessed September, 2013. Utah County Administrative Offices are located at 100 East Center Street, Provo UT 84606; phone: 801-370-8000. Although home to Native Americans for many centuries, the first white men to set foot in what is now known as Utah County were most likely Father Escalante and Father Dominquez and their party of explorers on September 23, 1776. From approximately 1825 to 1847, various trappers and mountain men spent time in the valley, but the first permanent settlers were Mormon pioneers sent south from the Salt Lake Valley by their leader, Brigham Young, in 1849. Provo was apparently the first settlement, getting its name from the Provo River, which in turn took its name from the mountain man, Etienne Provost. Many of the other communities were officially founded the following year,1850, including Alpine, American Fork, Lehi, Pleasant Grove, Payson and Springville.